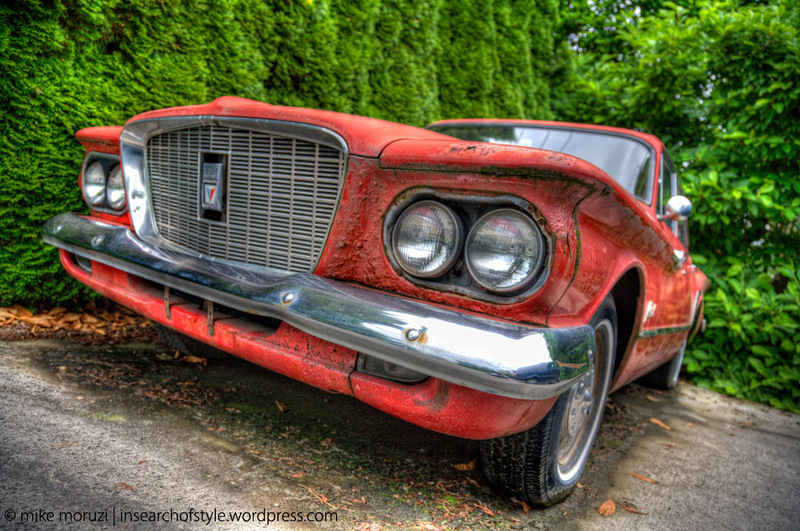 The Plymouth Valiant debuted in 1959 (model year 1960) with the tagline “Nobody’s kid brother, this one stands on its own four tires”. The one above is a first generation Valiant (1960-62). The valiant tag in the middle of the grille was removed for the ’62 model so this one must be a ’60 or a ’61. Based on the emblem, I’m pretty sure this is a ’61. For a car that’s 50 years old, I reckon it’s in pretty good shape whether it runs or not. The Morleyville Church, east of Banff, was built in 1875 by John McDougall and family. John’s father, Reverend George McDougall worked with the local indian tribe, the Stoney people, introducing them to Christianity. The church was built as part of his commitment to the Stoney people to provide them with access to Christianity. The church stopped being using in 1921 when a newer one was built nearby. In 1952, the church was restored and is now used for special occasions and services. Processing notes: I cropped out the boring bits of sky, then cranked up the tonal contrast in the ground, fence and church using Color Efex Pro. I used Viveza to darken the sky and Silver Efex Pro to convert to B&W (with a red filter) and to then partially restore colour to the image. 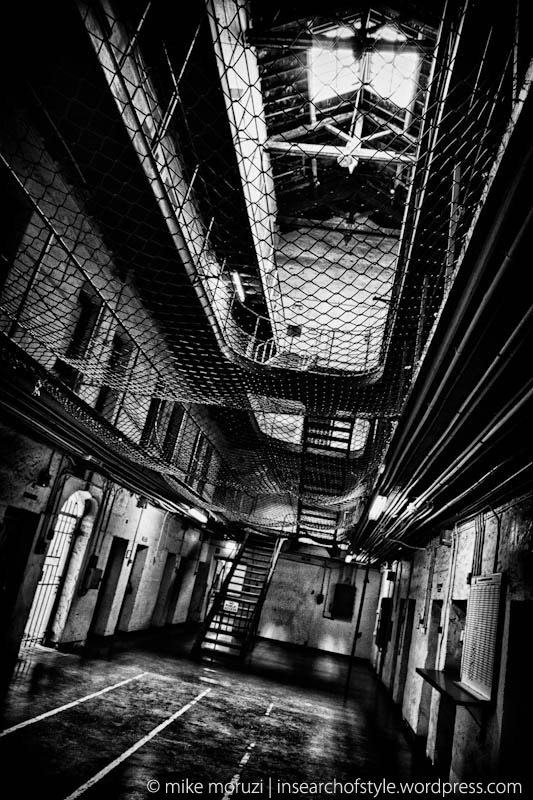 This is one of the cell blocks in Fremantle Prison located south of Perth in Western Australia. As a convicted offender, you did not want to find yourself in Fremantle prison. It was built in the 1850s by convicts and, in some ways, it didn’t get a lot of updating since then. It’s dark. The cells are very small – about 2m x 2m. The toilets in the cells were simple buckets. And that was when it was closed in 1991. You can find a few more pictures of the prison on my Flickr photostream. Processing notes: I just converted it to B&W in Silver Efex Pro tweaking the lighting in a few places. I then enhanced the texture in the floor, walls and ceiling to bring out a little more of the details. Lastly, I darkened the edges to draw attention into the photo. Back to a more conventional photo today. 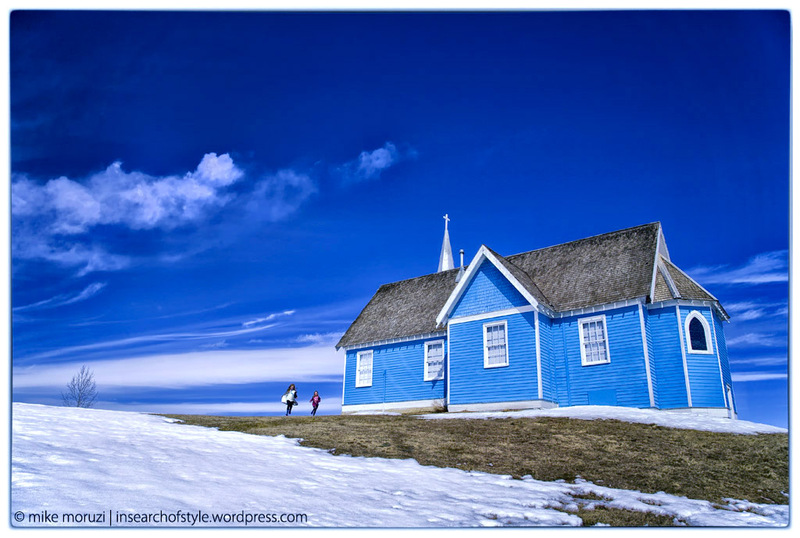 I had to go with colour to show off the brilliant blue of St. Edmund’s Church in Big Valley. This is the same church that I’ve featured over the last two days. Just shows how much alternate compositions and post-processing can produce different moods. After a little over two hours in the car, this was the first time I was able to let the girls out for a stretch. They spent about half an hour running around this church having enormous fun. No one ever said my kids were hard to entertain! It turned out that the hardest thing with this photo was getting the colour right for posting. WordPress recommends using the sRGB colour profile. I may still be a bit of a newb when it comes to colour profiles as this shot turned a very disturbing purple when I first uploaded it. I’m still not sure I worked it out in the end. Maybe I should stick with black and white! Processing notes: Primary editing was done using Viveza 2 in Photoshop. With Viveza I darkened the sky a bit, brightened the clouds and added structure to the wood siding on the church. Finally, I warmed it up just a touch with the Skylight filter in Color Efex. I reassigned the color profile in Photoshop. Same church as yesterday with different processing for a significantly different mood. 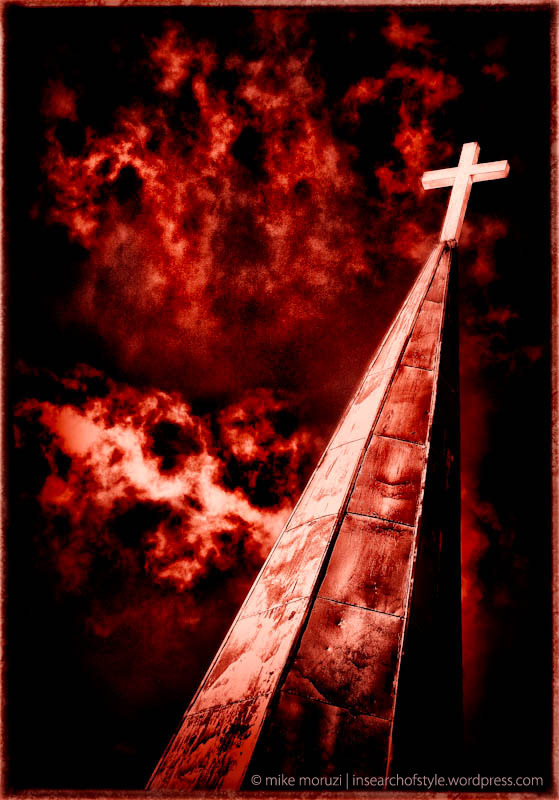 The clouds in the original image gave me the idea of fire and flame and the church as a beacon of safety. While I’m not a religious person, I understand the power of faith and religion especially how it can provide strength in hard times. Of course, while that’s what I was attempting to portray, it may be something completely different for you. Processing notes: This was originally a photo of a church steeple on a beautiful blue sky with wisps of cloud blowing over. In Photoshop, I used Viveza to substantially darken the sky and add structure and contrast to really bring out the clouds. 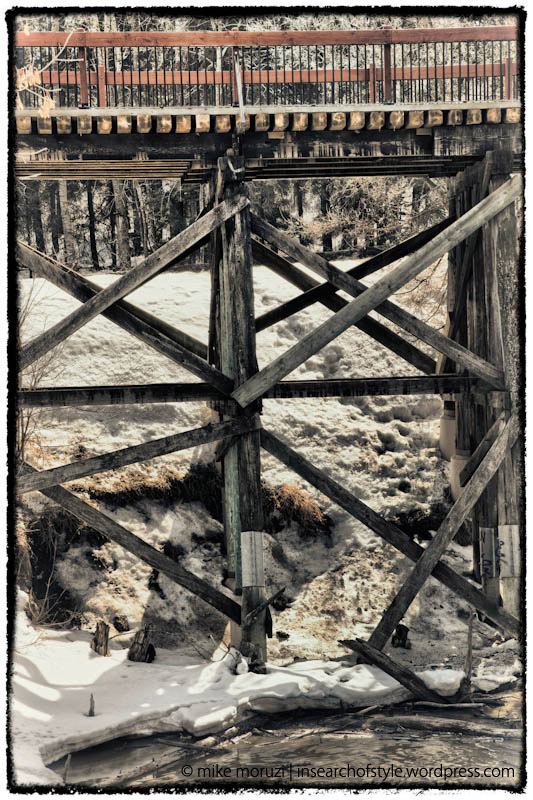 I also emphasized the texture in the steeple using the structure slider and selective adjustments. Over to Silver Efex Pro to convert to black and white. 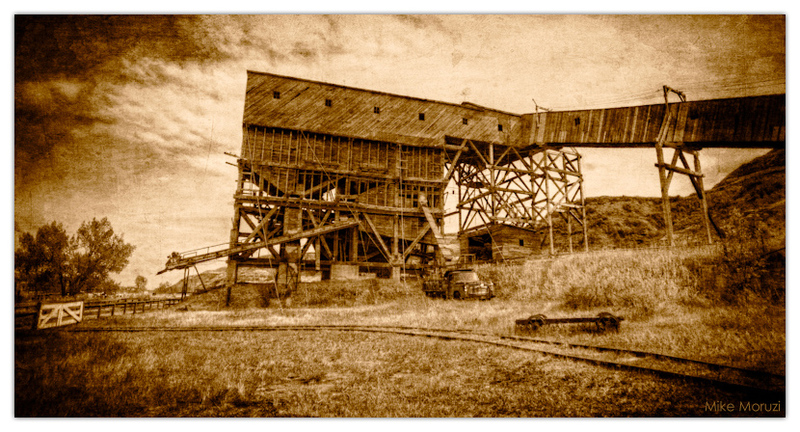 I toned the image red and then added burnt edges and a rough frame. That darkened the cross too much so I used a selective adjustment on the right side of the cross to bring up the highlights so the cross stood out and in front of the darkness. Back in Photoshop (no more filters) I used the burning (dodge/burn) tool set to 5% and shadows and went over all the clouds to darken them and to saturate the red/orange to give the clouds more an appearance of flames.